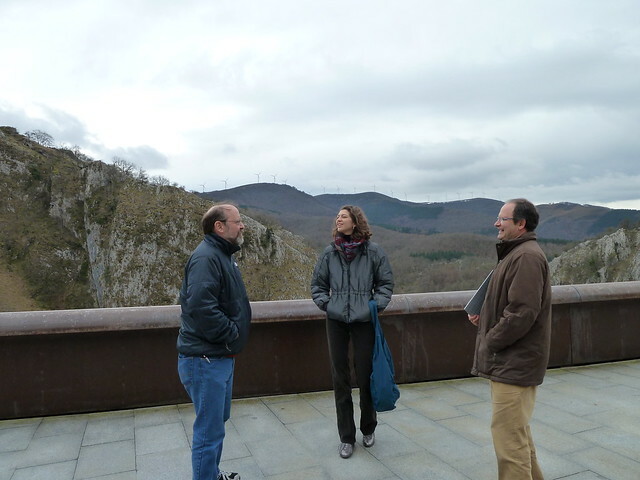 President Jeff Crosby, United Way Liaison Tony Dunn, and Elisha Goodman, an MIT student who is working with the New Lynn Project, travel to Mondragon, Spain to learn about the worker owned cooperatives in that region and investigate the possibility of building worker-owned co-ops in Lynn, Massachusetts. Jeff Crosby and Elisha Goodman learn about the basics on co-ops from Fred Freundlich. All around us the jobs that do exist outside of our labor union are getting worse. I know this from the calls that I get from our laid off members. The scariest question you can ask someone today is, “What are your kids going to do for a living?” Lynn, Massachusetts has practically been abandoned. While the median income in Marblehead, Massachusetts went up 20% in the last 20 years, it dropped in by 6-7% in Lynn in the same period, as good manufacturing jobs left. The Great Recession has made jobs a lot worse. Professor Andrew Sum at Northeastern’s Center for Labor Market Studies found that even in the worst period of the recession (last quarter of 2009) the top 20 percent of households were doing fine — basically at full employment. (“Recession, what recession?”) But the bottom 20 percent were at Great Depression levels of unemployment, even without counting people who could only manage to find a few hours of work a week. And while the great majority of people have suffered, corporations have made out. There have been massive productivity gains in the last two years, with huge pressure to produce more with less, especially with less workers. You can see this at every Local 201 workplace. All the benefit of the increased effort and efficiency has gone to corporate profits, in what Sum calls “the most lop-sided gains in corporate profits relative to real wages and salaries in our nation’s history”. By mid 2010 corporate profits had gone up 57%, while wages and salaries had gone down two percent. Sum’s articles are available here. In Spain, Italy, Argentina, and Cleveland and New York and even in the Boston area, workers have built their own businesses, worker-owned cooperatives. They raise money and determine among themselves how it will be spent. Every penny they make goes to wages, back into new products, or advanced research. No personal fortunes are amassed, no hedge-fund kings siphon off the proceeds into crazy stock ponzi schemes. These enterprises pay better, the jobs are more stable, and they produce cutting edge research and technology and often out-perform traditional for-profit competitors. And you can imagine, worker-owners don’t often vote to move their own jobs to China. How do they do it? That’s what I hope to learn here in Mondragon. I am traveling with Tony Dunn, United Way Liason for the North Shore Labor Council and director of the E-Team in Lynn, and Elisha Goodman, an MIT student who is working with the unions and community groups of the New Lynn Project to investigate building worker-owned co-ops in Lynn. The United Steelworkers of America, after losing hundreds of thousands of good jobs, is targeting ten factories to build as worker co-ops in the U.S. in a partnership with Mondragon. We got some initial ideas this afternoon when we net with Fred Freundlich, an American who married a Basque woman, lives here and works at Mondragon. Every few years a Congress of delegates from each of the co-ops makes overall decisions, such as how much of the profits from each of the 100+ co-ops go into the general fund, and how much the individual co-ops keep for their own development. The last Congress decided to set a rate of 15-40% of profits to go to the general funds. In a bad year a co-op would keep more; in a good year it would keep less. The general fund at their central Mondragon co-op bank lends money at low or no interest to co-ops that need it. Almost no one ever leaves employment at the Mondragon co-ops. Workers are offered work at a different co-op if theirs is losing orders, or early retirement. They get 80% of their pay while the central co-op placement service finds them work. In co-ops where the work is seasonal, a small percentage of temps who are not worker-owners can be hired. These workers don’t get the co-op benefits, and are limited to 15% of the workforce at the most. Even the managers never leave. The mid-level managers are paid at a rate close to traditional capitalist companies, but the salaries for higher-ups are limited, I infer at 70% of the market rate for other top managers. But they never leave either, because the work atmosphere and the support is so much better than in traditional companies. The focus is on manufacturing, and the extensive funding of Research and Development by both the individual co-ops and their own Mondragon University keeps the co-ops on the front-lines of product development. They have a machine tool factory that I will visit if I get a chance, and they are about to introduce an electric car. Post by Jeff Crosby, President of the North Shore Labor Council in Massachusetts. This post originally appeared on the North Shore Labor Council website on Tuesday, January 11, 2011. Congrats on a successful trip. Connecting what is happening in the Basque region to our Commonwealth certainly has a lot of potential. I spent two weeks there in 2008 as a delegate from our worker co-operative network, the Valley Alliance of Worker Co-operatives. Part of my work there was to understand why there are so few worker co-ops in the US and in Massachusetts as compared to similar, industrialized nations. After my trip we re-configured our structure to take on core characteristics of international co-op complexes like Mondragon and the Emilia Romagna region of Italy, focusing on co-op led co-op development. Since then our work has been very exciting and I would like to invite you to a conversation about or meeting of our system in western Massachusetts. Some basic information: VAWC, a ‘co-op of co-ops’, is funded and directed by co-ops themselves. Members pay dues funding staff development and support, pay 5% of surplus in to VAWC’s development fund, advertise in food co-op newsletters for the Working for a Co-operative Economy marketing campaign, and educate about the nature and benefits of co-operatives through co-created university curriculum. I am as interested in hearing more from you as I am in connecting two parts of our state in building a co-operative economy. For more, visit http://www.valleyworker.org or email me at adam@valleyworker.org.